Our difficult trips may involve hiking over uneven terrain, with some hikes including significant elevation gain or loss and at higher elevations (up to 12,000 ft). Itineraries may include three to six hour hikes and other activities such as horseback riding, mountain bicycling, rafting and kayaking, which require no previous experience. On many trips, passengers may elect to skip a day's activity, depending on logistics. In a country of such stark geographical contrasts as Argentina, here is a Patagonia hiking adventure trip that captures its extremes. You'll visit two of the continent's top attractions, from the southernmost region of Argentina Patagonia to witness the most famous glacier of all, Perito Moreno, to the vast Iguazú Falls on the northeastern border with Brazil. You'll visit three Argentina national parks, Iguazú, Los Glaciares and Tierra del Fuego. Experiencing nature in the glorious surroundings of Patagonia's glaciers and forests, you'll also learn about the history of Argentina's frontier here at the ends of the earth. This is an Argentina hiking adventure like no other. Your Argentina tour begins when you fly in to the Buenos Aires airport for international arrivals. From here, a Southern Explorations guide will take you into the city and transfer you to your hotel. You'll spend the rest of the day on your own enjoying the cosmopolitan amenities of this sophisticated city. While exploring the capital, called the "Paris of South America," we suggest adding our Four Balconies Tour to your trip for an excellent overview of the city's fascinating history. Overnight at a 4-star Buenos Aires hotel. Optional Self-Guided Tour: Glacier Museum (Approximate Fees: Museum - $20 (80 Argentine Pesos); Roundtrip bus - $6 (25 Argentine Pesos) For those interested in learning about the formation and recession of glaciers during their Patagonia tours, a visit to the Glaciarium is a must. This one-of-a-kind ice museum is located six miles outside El Calafate. To get there, every hour on the hour, buses leave from the center of town. After exploring the history of the Patagonian ice fields, you may cap off this memorable experience with a drink at the museum’s Glacio Bar. The entire bar including the drink cups, tables and chairs are made entirely of ice. OPTIONAL: Iguazu Falls Brazil $135 per Person – As long as they have come this far, many visitors elect to view both sides of the falls during their Iguazu tours. After breakfast, you set out across the border to the Brazilian national park. The Brazilian side offers panoramic views of the entire falls complex that cannot be seen elsewhere. Brazil’s national park also has an extensive network of bridges and platforms over the river, with breathtaking vistas. After a brief tour, you return to Argentina and continue exploring the falls. *Entering Brazil requires a visa, so please enquire about the visa process before confirming this option. Due to the country's geography and location, Argentina & Patagonia offers a wide variety of climates. The Argentine mainland is mostly temperate, with seasons reversed from those in the northern hemisphere. The northern areas of Salta and around Iguazú are tropical, while southern Patagonia's weather is often cold and windy and always unpredictable. Winter (from the end of June to the beginning of October) may be cold with some rain in certain areas of Argentina, while the Northwest enjoys sunny days and warm temperatures. Summer (from December to March) is hot and sometimes humid in Buenos Aires; warm and dry in the Northwest with intermittent summer rains; and cold but sunny and sometimes windy in Patagonia. A single supplement is the additional cost of a single traveler not sharing a room in double occupancy. Can’t find a date that works for you in the list below? Southern Explorations can arrange a private departure on any date that works with your schedule. Custom tours are also available. Contact us for details. Explore and photograph the incredibly beautiful Perito Moreno Glacier and wander the quaint streets of El Calafate. A: We offer a variety of pre-planned tours online and we’d love to design a custom trip just for you. Take a look at what we have online, then call an Adventure Travel Coordinator to discuss the trip that best fits your timeframe, budget and interests. A: Yes! We are happy to modify any tour to meet your needs and also add pre and post-excursion extensions. If you sign up for a group departure we cannot change the group portion, but we can add extensions before and after. Q: When is the best time to go to Argentina? A: Argentina’s large size and geographic orientation means it covers many climatic zone and different areas are better to visit during different times of the year. In the south, Patagonia and Tierra del Fuego are best visited from October through April. In the north, the season is inversed and your best time to travel is from April through November. Buenos Aires and the wine country around Mendoza can be visited year round. Q: What is the weather like in Argentina? A: The weather ranges from temperate summers and cold, snowy winters in the south to rainy summers and dry, warm winters in the north. You will find a detailed weather chart on the Overview page of each trip. You can also call your Adventure Travel Coordinator to discuss the weather trends for your trip. Q: What is a typical day like in Argentina? A: The typical day varies widely from trip to trip, but all tours will have full days with guided exploration. There will be time for rest and relaxation, as well as independent exploration of the cities and towns we visit. 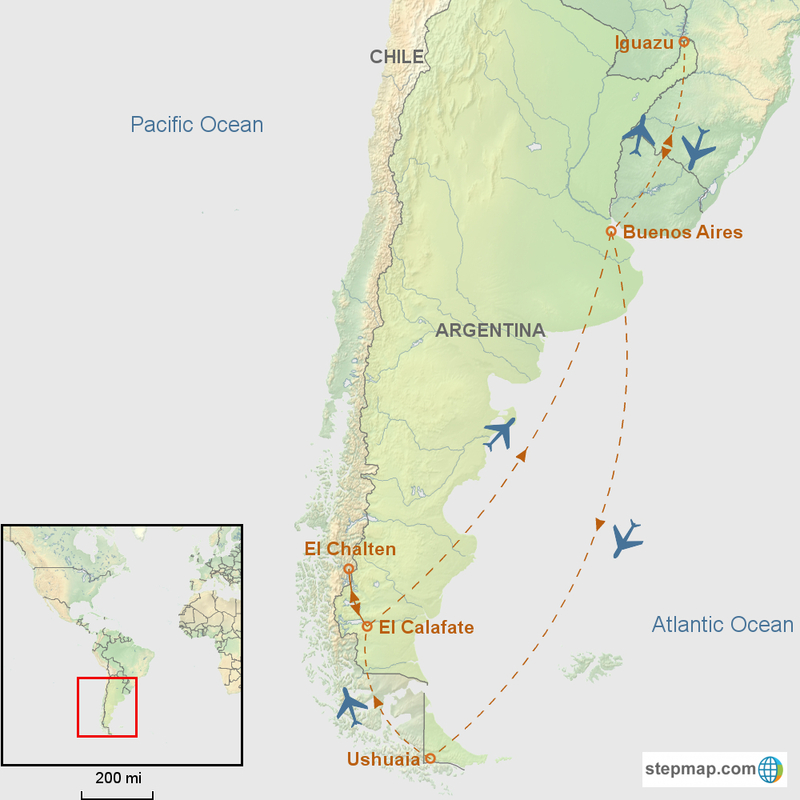 Due to the remote nature of Argentina’s most scenic areas, some long travel days will be required. Q: How physically fit do I need to be to enjoy a trip to Argentina? A: As long as you are able to walk a couple of miles at a leisurely pace and comfortably navigate uneven terrain, you will be able to enjoy most of our tours. Some of our more adventurous tours include activities like kayaking, ice climbing and hikes up to 12 miles. Please check the physical ratings on our trip pages or contact your Adventure Travel Coordinator to see if a particular itinerary is a good fit for you. Q: How much time do we need to visit Argentina? A: Because of the vast size of Argentina we recommend at least seven days. If you wish to visit multiple regions within Argentina we recommend 12 days or more. A: As a rule, the further in advance you can plan, the more options you will have. We recommend planning a trip at three to nine months in advance, but if you want to stay at very specific luxury hotels or travel over a holiday then we recommend planning nine months to a year in advance. A: Click here to see our booking and cancellation policies. A: The guides on all of our tours are experienced, fluent in English and hold a degree in a related field. The guides are experienced in the outdoors and trained in basic first aid. We tend to use the same guides as they are accustomed to the trips we offer and understand the Southern Explorations commitment to quality. A: We primarily work with 4-star hotels in Argentina and the occasional 3-star property, provided they meet our standards. We also work with several amazing 5-star properties. All of our hotels are clean, comfortable, well-located, offer en suite bathrooms and have been personally vetted by a Southern Explorations staff member. A: We will confirm all airfare within South America and this price is listed separately from our base tour costs. You are responsible for booking international flights to/from Argentina. A: Our Argentina trips are generally limited to 8 travelers, although some areas (all-inclusive lodge stays and cruises) may require that we form larger groups with other travelers. A: After booking you will receive a link to our online trip portal, which includes all of the need-to-know information that is specific to your itinerary. This includes packing lists, restaurant recommendations, tipping guides, FAQs, vaccine recommendations and currency information. Your Adventure Travel Coordinator will also be a great resource for any other information you may need. Q: I read about a “Reciprocity Fee” to enter Argentina, do I need to pay that? There is no longer a “Reciprocity Fee” required for travelers carrying US, Canadian or Australian Passports. If you carry a passport from a different country please check with your nearest Argentine consulate for more information.